This villa is situated in an elevated position on a quiet cul de sac in the popular residential area of Los Mojones approximately 10 minutes walk from the old town and harbour of Puerto del Carmen with its good selection of fish restaurants, shops and bars. 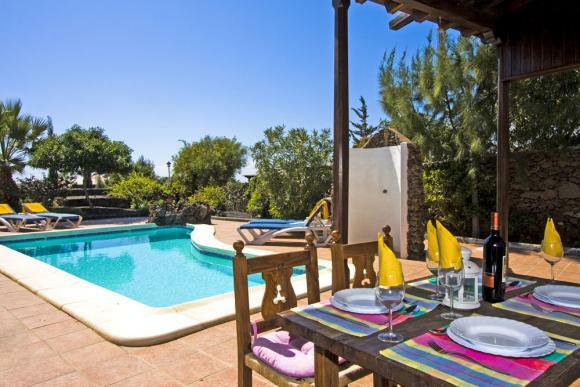 The style of the villa is rustic, built on two levels with all rooms opening out on to the sun terrace with private pool. On the ground floor, entrance is into an elevated dining area with large wooden table and chairs. 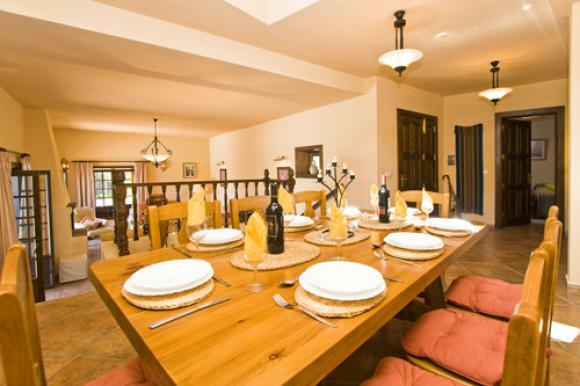 Steps lead down to a comfortable lounge with air conditioning, rustic fireplace, leather sofas, satellite TV (including BBC/ITV and all Sky Channels available in Lanzarote) , DVD player and portable music system with CD player. Terrace doors provide access to the pool. 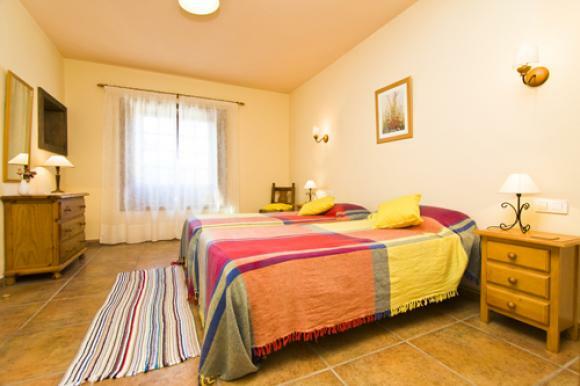 There is a spacious twin bedroom and shower room. 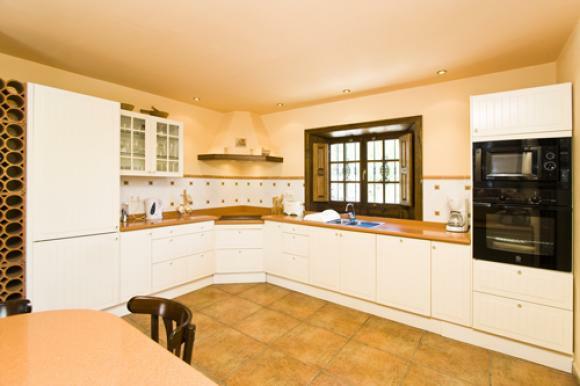 The fitted kitchen is equipped with 4 ring electric hob, oven, microwave, dishwasher, fridge/freezer, kettle, toaster, breakfast bar and terrace doors to the pool area. 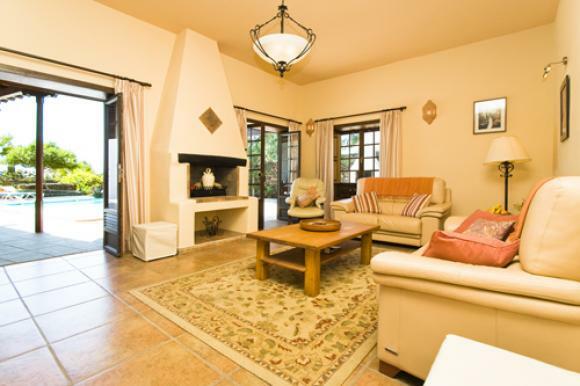 A hallway leads to a double bedroom with en suite shower room and master bedroom with wooden floor, large walk in wardrobe, patio doors to the pool area and en suite bathroom with corner bath, separate shower, two wash basins, toilet and bidet. The large open and covered terrace has sea views, sun beds, shower and built in barbecue all surrounded by large garden. The "L" shaped 7m x 4m pool has roman style steps and is heated in the winter months. Off street parking is available. On the lower floor is a basement twin bedroom with shower room, w.c and wash hand basin, large utility area with sink, washing machine, iron and ironing board. 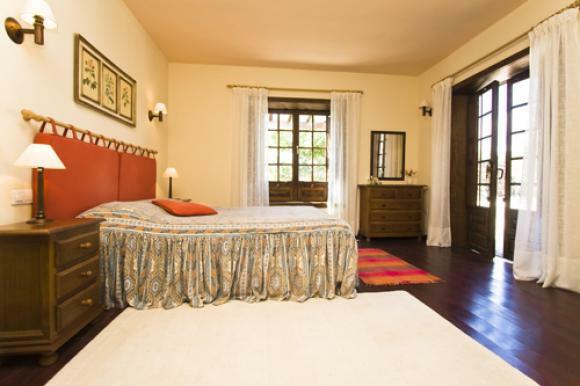 Air conditioning is in the master bedroom, lounge and dining room.